German Railroad, Inc. (DB AG) road number 01 150 express train steam locomotive. This museum locomotive of the Nürnberg Transportation Museum looks as does since being restored, with striking Wagner smoke deflectors and brass-colored boiler bands. The locomotive looks as it did in September of 2011. Model: The locomotive has an mfx digital decoder and extensive sound functions. It also has controlled high-efficiency propulsion and a can motor with a flywheel in the boiler. 3 axles powered. Traction tires. The locomotive and tender are constructed mostly of metal. A 7226 smoke generator can be installed in the locomotive. The triple headlights change over with the direction of travel. They and the smoke generator that can be installed in the locomotive will work in conventional operation and can be controlled digitally. The headlights are maintenance-free warm white LEDs. There is an adjustable close coupling between the locomotive and tender for different curves. There is a close coupler with a guide mechanism and an NEM pocket on the tender. The minimum radius for operation is 360 mm / 14-3/16. Protective piston rod sleeves are included. Length over the buffers 27.5 cm / 10-13/16. The locomotive comes in a wooden case. 01 150 – a legend of German and international railroad history. In the restored condition of September of 2011. Delivered in an exclusive wooden case. Documentation included about the restoration of this steam locomotive legend destroyed in the fire of October 17, 2005. This model of the restored express train steam locomotive, road number 01 150, is being produced in a one-time series only for the Marklin-Handler-Initiative (MHI) or Marklin Dealer Initiative (Exlusiv program). This locomotive will be delivered in 2012. 01 150 – Like a Phoenix from the Ashes It was already something special – the steam locomotive with road number 01 150. It first saw the light of day at Henschel in Kassel in 1935 with the builder number 22698. In the same year it took part in the Nurnberg Parade at the anniversary 100 Years of German Railroads. It opened the anniversary parade on December 8, 1935 at the Nurnberg switch yard at the head of nine other standard design express train steam locomotives (road numbers 01 151 to 155 and 03 209 to 212). Important stations during its normal service life were Bebra, Frankfurt/Main, and Giessen as well as the railroad maintenance facility in Hof starting in 1965, where the decision to retire it overtook this locomotive on November 13, 1973. In the same year the Bielefeld textile manufacturer Walter Seidensticker bought this retired locomotive and stored it in the maintenance facility in his home town. Searching for enthusiasts to do the overhaul work to put the locomotive back into operation Seidensticker ran into Olaf Teubert in 1980 as well as his colleagues Jochen Pook and Martin Hahlbohm from the railroad maintenance facility in Bielefeld. After work they invested countless hours restoring road number 01 150 which was ready to run again starting on March 18, 1982. Six active years of special runs and participation in parades as well as exhibitions followed. The crowning moment during this time was the locomotive and powered unit parades for the anniversary 150 Years of German Railroads in September of 1985 in Nurnberg, which the now 50 year old locomotive (by chance with the number of the anniversary) passed with flying colors. The active time for road number 01 150 ended in 1988 because there was no longer a home base after the dissolution and razing of the railroad maintenance facility in Bielefeld. The locomotive went back to the ownership of the German Railroad and then to the Transportation Museum in Nurnberg, where it was heavily damaged in a fire in 2005. But Olaf Teubert was not ready to give up. In the following years he collected donations from firms and private parties for the restoration of his locomotive. In October of 2010 everything was finally ready: All of the participants agreed on a restoration and operations concept, which was financially supported by Marklin. The steam locomotive facility at Meiningen was awarded the contract to restore the locomotive to operational condition. Starting in the fall of 2011 road number 01 150 will once again be allowed to be under steam. However, the appearance of this locomotive will change somewhat; it's being given large ears, i.e. Wagner smoke deflectors. The idea was to make the locomotive look as it did when first delivered in 1935. The DB conversions remained however, i.e. no central locking of the smoke box door and the pumps remained in the middle of the locomotive on the running boards. According to information from the German Railroad the plans are for road number 01 150 to be based at the DB Museum in Halle/Saale and to be operated from there by the association Traditionsgemeinschaft Bw Halle P. This association made a name for itself in the past with the operation of road number 03 1010, also a coal-fired steam locomotive. 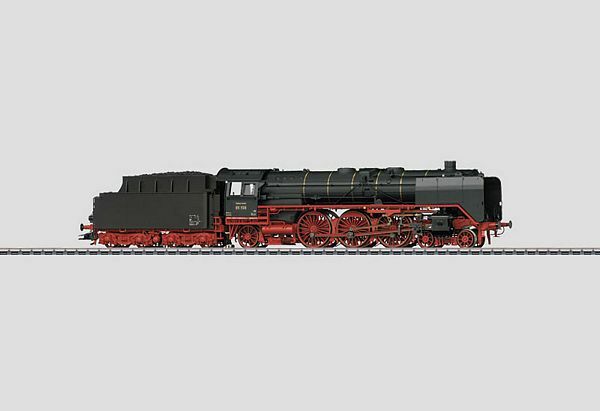 Marklin is participating financially to a considerable extent in the restoration of the great steam locomotive legends of German and international railroad history. Together with other partners such as the tireless donation collector Olaf Teubert, a former locomotive engineer for road number 01 150, the German Railroad Foundation, and the German Railroad, Inc. have created the financial basis to have road number 01 150 overhauled at the Meiningen Steam Locomotive Works to keep it in operating condition. The locomotive will be operated by the association Traditionsgemeinschaft Bw Halle P e.V which is based at the DB Museum in Halle/Saale. The locomotive will be used in the future in historic railroad service all over Germany. This model can be found in a DC version in the Trix H0 assortment under item no. 22250.